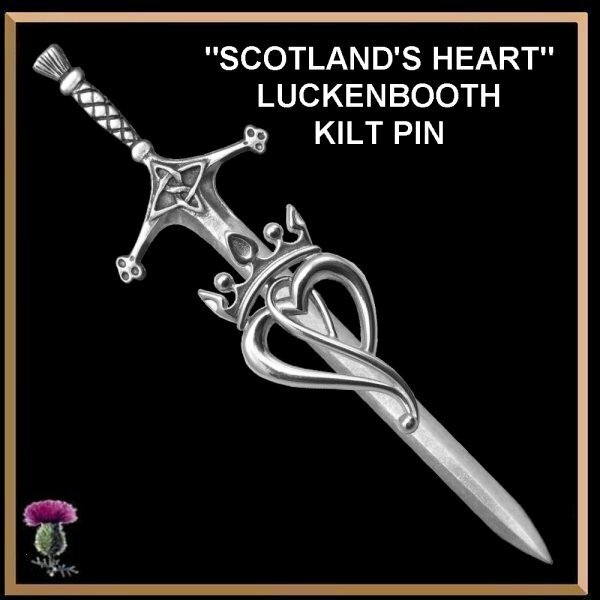 An exquisite and dramatic Luckenbooth, "Scotland's Heart" is available in a variety of formats; pendant, brooch, tie bar and kilt pin. This beautiful sterling silver "Scotland's Heart" Luckenbooth pendant is 1-1/4" (32mm) long and 3/4" (19mm) wide and includes a high quality 18" box link chain. This beautiful sterling silver "Scotland's Heart" Luckenbooth brooch is 1-1/4" (32mm) long and 3/4" (19mm) wide. This beautiful 10K or 14K gold "Scotland's Heart" Luckenbooth pendant is 1-1/4" (32mm) long and 3/4" (19mm) wide. In gold the chain is not included. This beautiful 10K or 14K gold "Scotland's Heart" Luckenbooth brooch is 1-1/4" (32mm) long and 3/4" (19mm) wide. This beautiful sterling silver "Scotland's Heart" Luckenbooth button loop tie bar is solid sterling silver and is 2- 1/2" (64mm) long by 5/16" (8mm) wide. The luckenbooth is 1-1/4" (32mm) long and 3/4" (19mm) wide. This beautiful sterling silver "Scotland's Heart" Luckenbooth button loop tie bar has the Luckenbooth in karat gold. The tie bar is solid sterling silver and is 2- 1/2" (64mm) long by 5/16" (8mm) wide. The luckenbooth is 1-1/4" (32mm) long and 3/4" (19mm) wide. The Luckenbooth can be ordered in either 10K gold or 14K gold. This beautiful sterling silver "Scotland's Heart" Luckenbooth kilt pin is solid sterling silver and is 3-7/8” by 1-5/16” (99mm x 33mm). The luckenbooth is 1-1/4" (32mm) long and 3/4" (19mm) wide.